It is only a few days until the Christmas holidays, or the holidays have already begun. Although the stars seem more crisp and vivid in winter, and some constellations of spring and autumn are spectacular, it is summer I connect with star-gazing. The warm nights and long lazy Christmas holidays seem to go with lying in your backyard looking upwards, or watching the night sky glittering above you on camping trips. Little wonder that the stars of summer are often the first we learn to identify, and the first we yearn towards as we gaze into infinitude. This is the companion list to Girls Names from Stars and Constellations, and should be read in conjunction with it. Need a super quick guide to the southern skies? Go here! 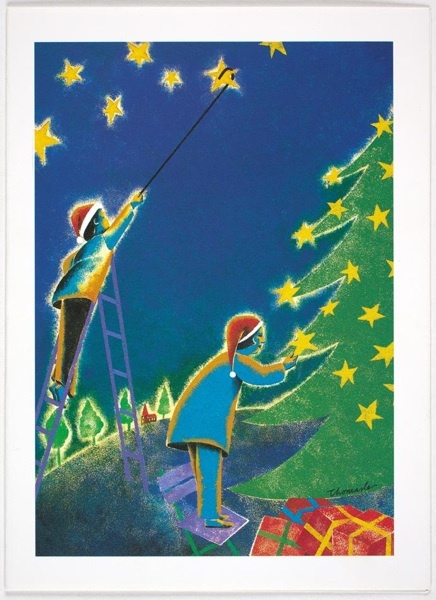 The picture used is a Christmas card created by Thomas Le, a refugee from Vietnam. He donated this artwork to help other migrants, and it is on show at the Museum of Victoria. Altair is the common name for Alpha Aquila, the brightest star in the constellation Aquila (“The Eagle”), and one of the brightest overall. Altair is a translation of the Arabic for “the flying eagle”, and the identification of the star with an eagle goes back to the Babylonians and Sumerians, who called Altair “The Eagle Star”. The Kulin people of central Victoria also saw the star as an eagle; it is Bunjil, their creator, who was blown into the sky by a great wind and became a star. Other peoples of southern Australia saw Altair as a hunter; it is his Boomerang thrown across the sky which became the constellation in which Gemma can be found. This cool star name can either be said al-TAH-yir, or al-TARE, and is also on the list Boys Names from Video Games. You can see Altair from Australia in winter and spring, and it’s in the north of the Milky Way. Asterion is the common name for Beta Canes Venatici, the second-brightest star in the constellation Canes Ventatici. This constellation began as the club of the constellation Boötes (“The Herdsman, The Ploughman”). However, due to a number of errors in translation from Greek to Arabic to Latin, “club” became “dogs”. Having invented these dogs, astronomers had a good squint and decided that the constellation looked like two greyhounds. It’s never explained why a herdsman would have hunting dogs rather than herding dogs. Astronomers named one star Chara (“dear”) and the other Asterion (“starry”) – then they swapped the names around to create further confusion. In Greek mythology, Asterion was the personal name of the Minotaur, a bull-headed monster who was the product of an unnatural coupling between a queen of Crete and a bull. It’s a flamboyant name, but it is actually a star name with a starry meaning; it’s said as-TEH-ri-on. Canes Ventatici is visible in the autumn from Australia, but its stars are not bright or easy to see. Atlas is the common name for 27 Tauri, a triple-star system in the constellation Taurus and part of the Pleiades cluster. As well as the Seven Sisters, which include Maia, the Pleiades cluster contains their parents, Atlas and Pleione. Atlas was one of the Titans, and after warring against the Olympians, he was sentenced to hold up the heavens on his shoulders (before this, the Sky and the Earth, parents of the Titans, were free to lie together in a lingering embrace, so Atlas is basically being used as a birth control device for deities). He has come to be a symbol of superhuman strength and stoic endurance. The name is so ancient that its meaning is very uncertain, but it may mean “endure”, “support”, or “sea”. Atlas has given his name to the Atlas Mountains in North Africa, and the Atlantic Ocean, as well as the word for a book filled with maps. The name is starting to have a mild vogue here. You will be able to see Atlas in the Pleiades during summer in Australia. The star Mu Cephei is commonly known as Herschel’s Garnet Star, because when astronomer William Herschel described it, he wrote that it was “a very fine deep garnet colour”. Indeed it is, being a red supergiant that is one of the largest in the Milky Way. It’s in the constellation Cepheus, which represents Andromeda’s father. Without doubt he is the dullest creature in the whole Andromeda drama, but I guess since they put the sea monster in the sky, it would have seemed rude to leave him out. You may recall that the aliens in TV comedy 3rd Rock From The Sun came from a planet in a galaxy on the Cepheus border. Unfortunately, Cepheus is only visible in the northern hemisphere, so we cannot see the Garnet Star from here. The colour garnet is named for the red gemstone; its name is said to be derived from the (also red) pomegranate fruit which means “seeded apple”. It’s a unisex name, but historically better known as masculine in Australia. Keid is a common name for Omicron2 Eridani, or 40 Eridani, a triple star system in the constellation Eridanus consisting of two red dwarfs and a white dwarf. Eridanus represents a great river, and is meant to be the water pouring from the jar of the Water Bearer, the constellation Aquarius. In ancient times, it was said to be the path of souls. Eridanus can be easily seen from Australia; it is virtually overhead during the summer months. You can see one of the red dwarf stars in Keid with the naked eye; however the other two stars can only be viewed through a telescope. In the TV series Star Trek, 40 Eridani is the location of the planet Vulcan, home of Mr Spock. Eridanus is also a system of planets in the video game Halo, so it’s got sci-fi credentials galore. Keid is from the Arabic word for “eggshells”, and can be pronounced KYED or KEED. I prefer KEED, but KYED sounds like popular Kai (maybe too much, as people will no doubt confuse the two names). Kio (KEE-oh) is the ancient Chinese name for Spica, the common name for Alpha Virginis, a blue giant binary star and the brightest in the constellation Virgo. While Spica means “ear of wheat” in Latin, Kio comes from the Chinese for “horn, spike”, as it was seen as “the horn of Jupiter”. Spica was the star used to discover the precession of the equinoxes, and the constellation Virgo contains the spring equinox point (autumn equinox in the northern hemisphere). The constellation has represented a goddess holding sheaves of grain from the earliest beginnings of astronomy in Babylonia. Not only is Kio one of those perky three-letter names that appeal to many people, but the Chinese saw Spica as a “lucky star” – what could be more positive than being named after a lucky star? The constellation Virgo can be seen throughout autumn and winter in Australia, and the very brightness of Spica makes it easy to find. Leo is a familiar constellation, because it is one of those in the zodiac. It’s already in the list Boys Names From the Top 100 of the 1930s, however I think it is worth revisiting from an astronomical viewpoint. The constellation’s name means “lion”, and seems to have been pictured as a lion by many ancient civilisations. I’m not sure if there was a single original Lion in mythology, but the Babylonians had many leonine protective gods, and a winged lion was the symbol for the city of Babylon. The Ancient Greeks identified it with the Nemean lion, a monstrous beast, both fierce and cunning, which was killed by Heracles as the first of his twelve labours. Its hide was impervious to attack, so Heracles wore it as his armour. The constellation Leo is truly majestic, and contains many bright stars. The chief of these is Regulus, also called The King Star, and The Heart of the Lion. Leo can be seen for most of the year, but is easiest to view in late summer to early autumn from Australia. Nash is a common name for Gamma Sagitarrii, an orange giant binary star in the constellation Sagittarius. Sagittarius depicts a centaur, said to represent the wise teacher and healer Chiron. The Milky Way is at its densest in Sagittarius, as this is where the centre of the galaxy lies, so it contains many star clusters and nebulae. In Australia this impressive constellation is easy to find, and we also get the best view of it, being able to see the Milky Way so much more clearly. Look in the west part of the sky in the early evening, halfway between the horizon and the point directly overhead. Its brightest stars form a recognisable shape which is called The Teapot; Nash is the spout of this teapot. Sagittarius is most visible in the middle of winter, and bright enough that you can see it even if there is a moon. The name Nash is from the Arabic for “arrowhead”, for this star is the tip of the archer’s arrow, which points toward the star Antares, in Scorpius. It’s also a surname derived from the word for “ash tree”. Orion is a constellation representing a character from Greek mythology. This gigantic hunter seems to be a bawdy folk hero – larger than life and twice as natural. It is lusty Orion who pursued the Pleiades, so that Zeus had to turn them to stars for their protection. One version of his ending is that Orion boasted of being able to kill any animal on Earth, and so the Earth goddess, in her displeasure, created the Scorpion to sting him to death. Both Orion and the Scorpion were placed in the sky as constellations. Orion contains many brilliant stars, such as Betelgeuse, Rigel and Bellatrix, and even the astronomical novice can locate the three stars forming Orion’s Belt; I was taught these were The Three Sisters (a South African name). Orion is clearly visible in the summer from Australia, and because it is positioned differently in the southern hemisphere, we sometimes call this constellation The Saucepan. The name Orion is from the Akkadian for “heaven’s light”. Perseus is a constellation representing a character from Greek mythology; he was a hero, the son of Zeus and a mortal princess. Perseus led an extremely exciting life, part fairytale, part soap opera, but he is probably best known for killing the Gorgon Medusa, a woman who had snakes on her head, and thus had a permanent bad hair day of epic proportions. Perseus had nifty flying sandals to zip around on, although much later people liked to imagine him riding the flying horse Pegasus (this never actually happened in the legends). Perseus rescued and married Princess Andromeda, and the constellation has his hand reaching up to Andromeda’s foot, to show the moment of deliverance. The star Algol in Perseus is called The Demon Star, and represents the head of Medusa. We can see the constellation in late spring and summer from Australia, and the meaning of Perseus is not certain; it may mean “to destroy”. Percy is the obvious nickname, and the one used in the novel series Percy Jackson and the Olympians by Rick Riordan. Phoenix is a minor constellation in the southern sky named after the mythical bird. The Phoenix can be found in the mythologies of many lands, from Egypt to China to Russia, and is famous for being able to renew itself in fire, which made it a popular symbol of resurrection in Christianity. Its name is from the Greek for “crimson”. Phoenix has become a popular name lately; it’s unisex, but used more for boys. It’s hard not to connect it to The Order of the Phoenix in the Harry Potter books; Fawkes the phoenix is the loyal pet of Albus Dumbledore. A phoenix is also a major character in the children’s book The Phoenix and the Carpet by Edith Nesbit. The constellation Phoenix can be seen from Australia during the summer, however it is faint and only possesses two stars bright enough to be seen with the naked eye. Sirius is the common name for Alpha Canis Majoris, a binary star which is the brightest in the constellation Canis Major (“Great Dog”), and the brightest in the sky, being almost twice as bright as Canopus, the second-brightest. Canis Major is seen as one of the dogs following the hunter Orion, with Sirius representing its doggy nose. However, Sirius was considered to be a dog in his own right, and is called The Dog Star. In the northern hemisphere, Sirius rises in summer, and so the very hottest time of year is called “the dog days”. Although Sirius rises in the winter here, we don’t call the coldest time of year the dog days, although strictly speaking, we should! In July, you can see Sirius both evening and morning. Almost every culture in the world has connected Sirius with dogs or wolves, but the Boorong people of Victoria saw it as part of a constellation representing the Wedge-Tailed Eagle – one of the most important of the spirit elders. The Sirius was also the flagship for the First Fleet to Australia, giving it another Australian connection. Its name comes from the Greek for “burning, scorching”. What about Regulus? It makes for a very good name and its a star in the Leo constellation and one of my favorite stars along with Sirius and Andromeda. I so adore star names, and you’ve done some of favourites here! Orion, Asterion and Sirius are particular long-held loves. Thank you! I love Orion and Sirius, and Asterion is very striking. As I was writing it, I had a feeling that Asterion was the name of a son of a famous occultist; maybe I dreamed it as I can’t find anything online. It just seemed oddly familiar.